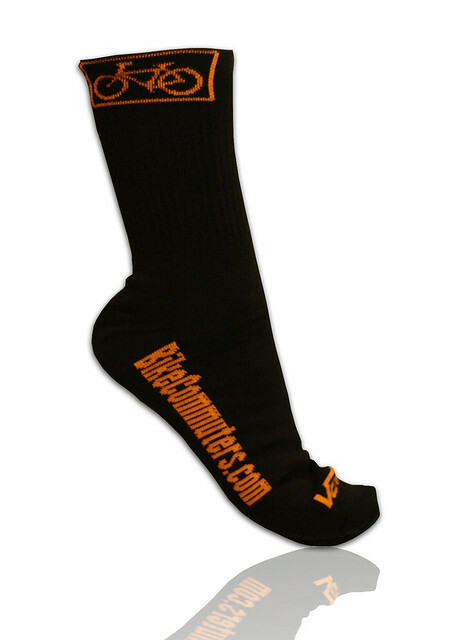 BikeCommuters.com > Commute > BikeCommuters.com Wool Socks-Now Available! For those of you who didn’t win our sock give-away contest, now’s your chance to own a genuine pair of BikeCommuters.com Wool Socks. The price for a pair of dreamy socks is only $15, SHIPPED! (US ONLY) We only have a limited number of these and most likely we won’t bring them back because we plan on spending the money we made on the socks on temporary tattoos and Slurpees. Hurry, buy a pair now…besides, the cute bicycle sign on the socks totally rock! 60% Wool, 25% Acrylic, 10% polypropylene, 5% spandex. 100% kickass. You can wear these socks for cycling, beer drinking, pretzel eating, and to job interviews. One thing great about our socks: if you ever get stuck in the snow, you can remove one sock, place snow inside and let the snow melt. You can then drink that melted snow since the sock works like a filter. See…these socks are way more useful than any regular socks, they can help keep you alive! Oh, by the way fellas, chicks dig a guy with sweet socks. Our socks can be your ice breaker, “Hello! My name is Octavious. Check out my socks!” This is when the ladies start ooohing and say, “Cute socks!” Yep. Ladies, if you are in a relationship with someone and want to take it to the next level…BAM! SOCKS! Those are some really sweet socks, but I’m guessing that you already knew that. The sizing on those socks is really specific, so I’m guessing that pulling them over larger feet would somewhat stretch the knitting beyond the point where these socks would be amazing? How tall are these socks? Are they traditional cycling sock cuff, or are these tall Lance Armstrong socks? They’re tall…not LA tall, but “winter tall”. Are they over the calf tall? In winter I prefer over the calf tall. I have seen a lot of socks that claim to be winter socks but they don’t cover the calf and like all socks that don’t go over the calf they will drop to your ankles. This makes them no better at protecting you from the the cold than ankle socks. I’ll get some pics of my spindly shanks wearing them to dispel all the concerns, ok? Stand by. Also keep in mind folks, the photo of the sock you see above is my wife’s leg wearing a large sock. She should have been sporting the medium. I received my socks today. I will caution buyers that if you wear a size 9.5, you really should buy a medium instead of a large, men. These are pretty long on me. I will relegate them to use with knickers, as they hit me right below my calf. Nice socks, good quality, just size down if you wear a 9.5.